20minutos.es has this one in their daily gallery. 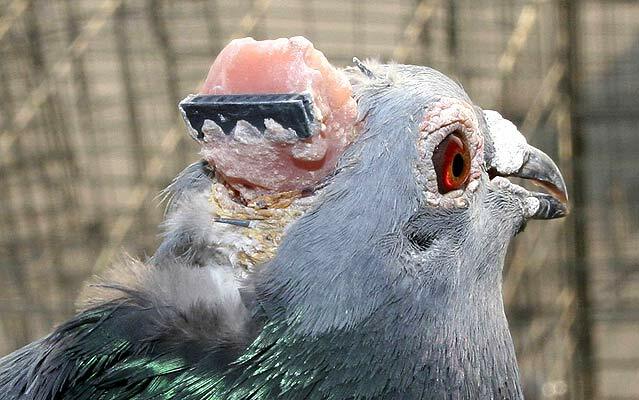 It's Shandong University in Qingdao, China, and they say they've worked out how to place electrodes in the dove's brain such that they can direct where it flies. Anyway, I sort of doubt it. The decisions on where and how to fly roll through the bird's brain really fast. They may be able to tell it to turn left one time, lowering its left wing or whatever, but they surely can't direct it as if with a joystick or Wii controller. The picture is striking, because it looks like these guys are just rudely cutting into the bird's skull, inserting their controller, and then covering the whole wound up with a hot glue gun. (It's probably not actually glue, but still.) It just doesn't seem like there would be enough bogus science involved to justify hurting the animal. This was in the Metro yesterday, but without such a graphic picture. I thought at the time that it sounded grim. That's definitely a pigeon in my book. the Chinese definitely need a PETA chapter. In general parlance the terms "dove" and "pigeon" are used somewhat interchangeably. In ornithological practice there is a tendency for "dove" to be used for smaller species and "pigeon" for larger ones, but this is in no way consistently applied, and historically the common names for these birds involve much variation between "dove" and "pigeon". dove == pigeon == flying rat. "We need mind control! I dont care if you have to open-air the brain, do it!" I can understand the use of animals in some experiments for medical research but only if there is no other alternative. This just seems needlessly cruel. 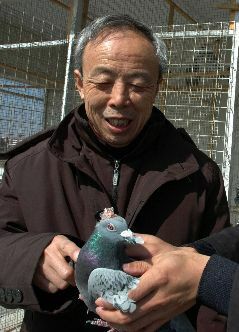 I hope every bird in China craps on the researcher's heads and then pecks their eyes out. Oh, the fun I'll have with this...! My partner is terrified of birds. I *need* to get my hands on one of these things. That picture kind of reminds me of how lobster tails are served. There follows an untranslatable play on words with the use of local idiomatic expressions.